Question: Can you begin by saying something about your background and your interest in medical inspired art? Angela Palmer: Art is my second career. When I was a teenager I dropped out of Edinburgh College of Art and became a journalist. I was editor of the PHS column on The Times; News Editor of The Observer; Editor of the Observer Magazine; then Editor of ELLE magazine. I then went to live in Hong Kong with my husband and young children where I started to paint again. I sat on the streets with my watercolours recording that crazy, vibrant, exuberant city. When I returned to the UK I decided to finish off the Fine Art degree I’d dropped out of as a teenager. I got a place at The Ruskin School of Drawing and Fine Art in Oxford and after graduating I went to the Royal College of Art in London. For a holiday project, the Ruskin students were charged to create a three-dimensional work based on our anatomy lessons. Inspiration came during the holidays when I was in the History of Science Museum in Oxford with my three young children, trying desperately to introduce them to matters scientific. It was fairly fruitless, their attention span was woefully short: it was a hot day and they wanted ice-cream. As they dragged me out of the museum, whinging and whining, my eye fell upon an intriguing exhibit by the Nobel laureate Dorothy Hodgkin constructed in the 1940s. With a thick black pen, Hodgkin had drawn the electron density contour images of the penicillin molecule on horizontal sheets of perspex. These sheets were then separated at each of the four corners with metal nuts, and the molecules took on a three dimensional form. 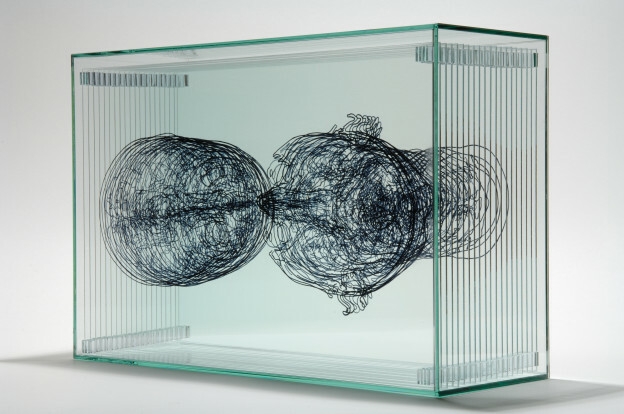 As I gazed at this object – a very beautiful object – it struck me that I could adapt Hodgkin’s method by drawing details of the human form, slices of the human corpse, on multiple sheets of glass, presented in three dimensions, but on a vertical plane. 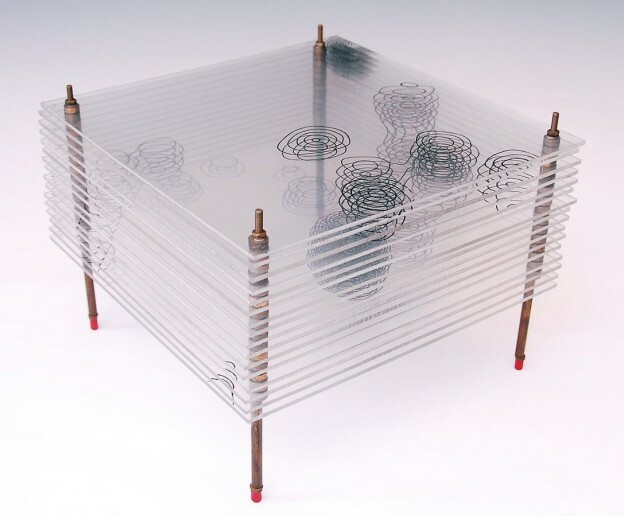 Model of the Structure of Penicillin, by Dorothy Hodgkin, Oxford, c.1945 by Museum of the History of Science, University of Oxford – Museum of the History of Science, University of Oxford. But first I needed slices of a cadaver. The corpses at the Anatomy Dept were more or less in one piece, save for the odd incision by medical students. I found the perfect book in Blackwell’s Medical Section: a series of slices of an old woman who had been frozen and sliced at Cambridge’s Medical School. 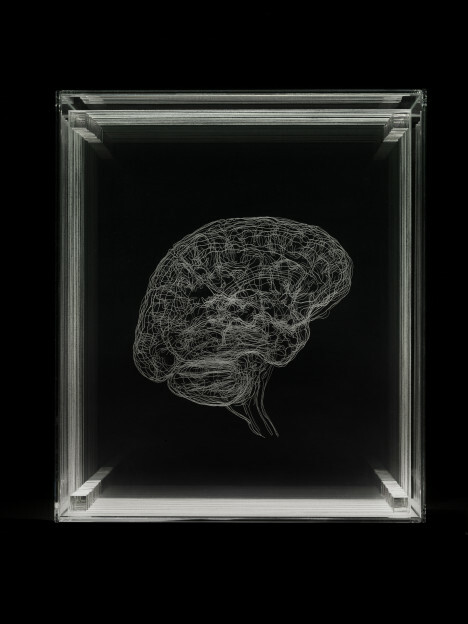 I drew details onto multiple sheets of glass, the kind you get for your greenhouse at a DIY store, and then separated each sheet with small uniform–size cubes of potato. My technique is somewhat more sophisticated now. It was a crude attempt at first but the concept certainly seemed to have possibilities. Here was a representation – a portrait of a woman but an entirely objective one. After completing the first piece, I soon discovered there is, perhaps not surprisingly, a paucity of frozen, sliced cadavers. Dr Matthew Wood, senior lecturer in anatomy at Oxford University, suggested I move to living beings and directed me to the man with whom I would enjoy many years of fruitful and fascinating collaborations: Dr Stephen Golding, consultant radiologist at the John Radcliffe Hospital in Oxford. He explained that he couldn’t provide me with any scans of patients because of confidentiality, but suggested I submit myself for scanning. Together with his colleague Dr Chris Alvey, Dr Golding carried out a full body MRI on me from which I could begin to generate a series of self-portraits. Question: You have stated that “the desire to ‘map’” is at the core of your work. What do you mean by this? Angela Palmer: I have always been inspired my maps, contour lines in particular seem to excite a response in my brain. It began when I was a school child in geography classes; I was utterly fascinated by OS maps and the contour lines. 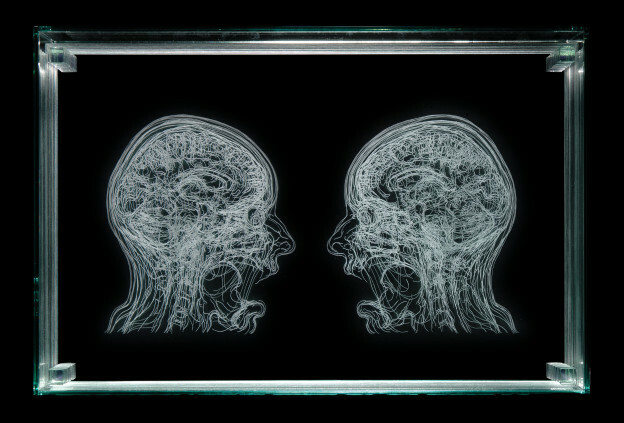 Question: In your work you use images from MRI and CT scans from animals and human. What inspires you most about those images?